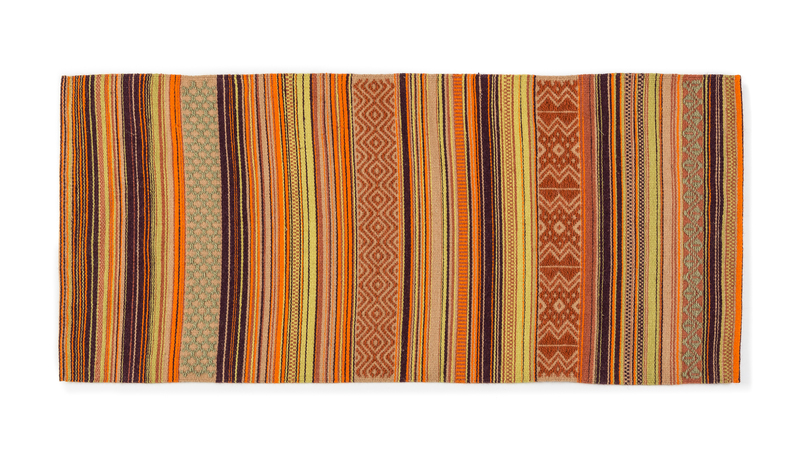 This cotton and Sardinian wool carpet features a vibrant combination of warm orange and brown shades, applied to the traditional a date decoration, characterized by typical geometrical bands inspired by the traditional repertoire, decorated with wide sections of many-coloured stripes. 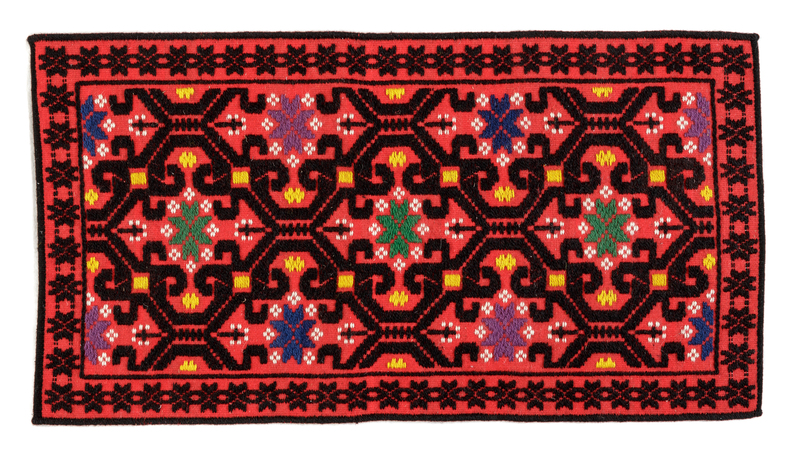 Rhombuses and intertwined geometric patterns typical of the traditional iconography of the village of Aggius, a composition locally called Lu pomu, are woven into the delicate colour of this carpet in Sardinian wool. This carpet in Sardinian wool features a stark contrast of colours against a red background. It is distinctive of the textile tradition of Aggius and is characterised by the striking geometric decoration with large-mesh interlacing, hooks and modules of stars. Laboratorio Tessile Prof. Cannas, located at the heart of the Gallura region, in the picturesque setting of the granite mountains in the countryside of Aggius, has a tight bond with local textile tradition, characterized by peculiar local style and technique. Being the result of a long and unique history made by women, the workshop was founded as a cooperative in 1997, and changed into a copartnership in 2005 by ten founding members. The company managed the Aggius ISOLA (Istituto Sardo Organizzazione Lavoro Artigiano) Pilot Center until its conclusion. The venues include original and large rooms that now host the workshop where the craftsmen work on the several flat handlooms, surrounded by a collection of colourful rugs. The mail production of all'antica cotton and wool Sardinian products, with the typical a date motifs, stripes with geometric elements, each of which has a specific name and a symbolic value, is the expressive jargon of local weaving. 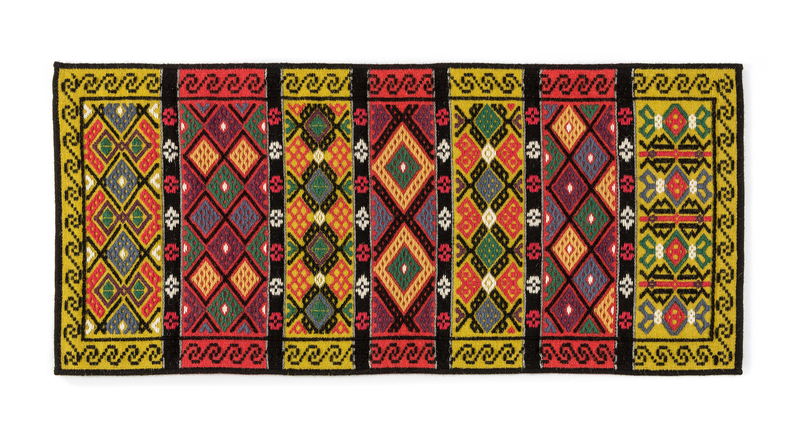 The production includes several tapestries and carpets, other textile furnishing accessories such as pillows, bedspreads, towels, and traditional artefacts, such as saddlebags. The handmade products are an excellent testimony of traditional weaving, enriched by a collection of the most recent reinterpretations. The distinctive contrasting colours, that is, red, black, yellow and purple, combined with typical geometric shapes, give the textile production of Aggius an exclusive touch. Weaving is performed with a traditional handloom following the all'antiga technique, a solid weaving technique, or with the a soprariccio relief technique, and the canvas technique, using Sardinian wool, regular wool, cotton, linen and recycled fabric.